First Sentence: One summer evening in the year 1848, three Cardinals and a missionary Bishop from America were dining together in the gardens of a villa in the Sabine hills, overlooking Rome. ...We move on to some lamentations. I’ve posted about the lack of books by women on The List at some length in the past. All I want to add right now is that my general lack of enthusiasm for the books by women that actually made it onto The List is kind of a tragedy. I read My Ántonia, also by Willa Cather, in 2014, and I liked that book a bit better than this one. 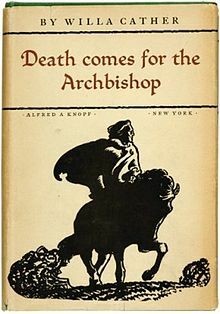 In fact I’m afraid that the bulk of my review of Death Comes for the Archbishop will be in the context of other books. To dispense with the plot, inasmuch as there is one, a young French priest, Jean Latour, is nominated by some Cardinals to be the first bishop of the new American territory of New Mexico. It’s largely unclear what the extent of this territory is (as I imagine it was historically), but basically the bishop and his friend Father Joseph Vaillant spend most of the rest of their lives touring around this area and serving the people there. Eventually Bishop Latour becomes an Archbishop, and he builds a cathedral. The book reads more like a collection of short stories and vignettes than a novel. The setting is powerfully and wonderfully described; the friendship between the two priests (who have been together since the seminary in France) is gorgeous and moving by the end of the book. I found the novel lacking, though. I’ll quickly mention before I get into it that Kit Carson is a character in the book, which got me wondering about whether Bishop Latour was a real person as well. Turns out: not exactly. The real first bishop of New Mexico was a man named Jean-Baptiste Lamy who inspired and informed the character Cather created. Anyway, this book is the oldest of an unofficial “missionary trilogy” by three different authors that of course I read in reverse order. When I say this is an unofficial trilogy I mean that I am, as far as I know, making it up right now for the purposes of this blog. The last book is Joseph Boyden’s The Orenda, which I also read in 2014. That book has the least overt Catholicism, with its French Jesuit, Christophe, being one of three major characters in the novel, and the focus less on matters of faith than of colonialism. He’s a missionary in 17th century eastern Canada. However, it’s the only one of the three books that provides a point of view for those who are receiving the ministry, which is an important development. The middle book is Shūsaku Endō’s Silence. I very briefly mentioned this book in my review of Small Gods but didn’t get around to reviewing it for the same reasons that I put off this review. In fact I got both of these books from the library at the same time. Silence had come to my attention via a list of books being adapted for film in the next few years, and I thought it would be a good companion piece to read not long after The Orenda. I wasn’t wrong, because it’s the best of this “missionary trilogy.” In Silence, the main character is a Portuguese Jesuit, whose name is Sebastião Rodrigues (but I had to look that up because he’s almost never named in the novel). Anyway, he travels to Japan during a time in the 17th century when the Christians there were being hunted down and seriously persecuted after some early inroads by the Catholic Church. Often, this takes the form of making people renounce their faith (“apostatize” appears more frequently here than I’ve ever seen it before, and much much more seriously than the way I self-style myself an apostate). Written by an actual Japanese Catholic, this book goes amazingly deep into matters of faith, or rather of doubt, and the ultimate silence of God in the face of suffering and death. If you have to choose to only read one of these three books, make it this one. In Death Comes for the Archbishop, the 17th century-style missionary work is two hundred years in the past, but the Catholic Church has gone a bit wild, and Bishop Latour appears to tame it. All three of these books bring up all kinds of questions about things like race, evangelism, faith, worship, etc, and confront those things with various levels of success. The problem with Death Comes for the Archbishop is that, being old, it’s not as sophisticated when it comes to some of this stuff as it needs to be. This isn’t to say that its point of view is necessarily straightforward when it comes to questions of religion/oppression/colonialism, and I appreciate that. In fact the biggest problem was that I read this book so soon after Silence, and the violent ambiguity of that novel stands so high above the warmth and self-assurance of this one. To sum up, this novel feels inessential to me. It’s historically interesting, to be sure, and has good stuff in it, but it’s not especially powerful. I’m giving it a “meh” rating, but I will say that it might be recommended reading if one was to read the “missionary trilogy” in publication order, which would make it feel less like a devolution. That air would disappear from the whole earth in time, perhaps; but long after his day. He did not know just when it had become so necessary for him, but he had come back to die in exile for the sake of it. Something soft and wild and free, something that whispered to the ear on the pillow, lightened the heart, softly, softly picked the lock, slid the bolts, and released the prisoned spirit of man into the wind, into the blue and gold, into the morning, into the morning!